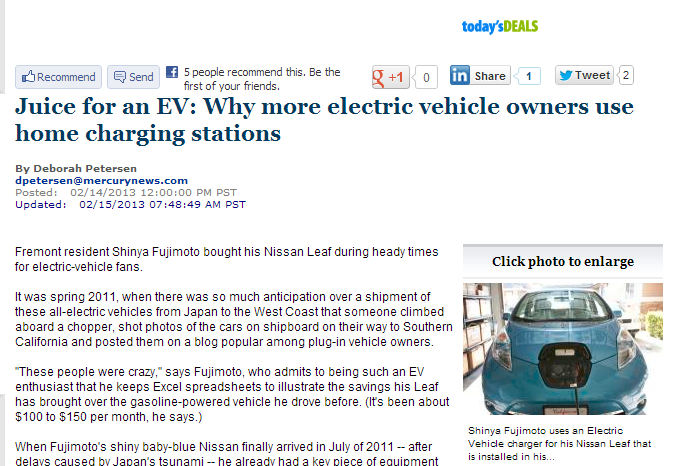 The story I wrote for the San Jose Mercury News about electric vehicle home charging stations (EVSE) is now online. Here’s the link . It will also appear on the cover of the Home & Garden section in Saturday’s newspaper. My husband and I are still awaiting estimates from the electrician for our charging station, which we hope will be paid for through the EV Project, which as I discuss in the story and in a previous blog, is quickly winding down. The project provides funding for the installation of home charging stations to homeowners in certain zip codes in nine U.S. states (and Washington D.C.) who qualify for the program. It was a bit of a shock to receive our utility bill – the first one covering an entire month since my husband leased the 2012 Nissan Leaf in January. It was more than $100 higher than usual, and I assume that most of that is due to the “trickle” charging my husband is doing overnight through our household outlet. Having driven 1,400 miles with the Leaf during that period, my husband figures that the savings compared to driving a gasoline-fueled car was about $96 even with the boost in the electric bill from PG&E. These are very rough figures, and we plan to pay more careful attention to them going forward. I hope that after the charger is installed and our home and we sign up for off-peak rates with PG&E, we will see a significant drop in our electricity bill. We received our utility bill today and thanks to the new discounted rate, our bill dropped to almost half. Woohoo! PG&E was nice enough to apply the new rate from Day 1 of billing cycle dispite our approval date was a week past this billing cycle. It really saved a lot on gas cuz I’ve been taking my car to work like 10 times. You got a chance to take your car to work yet? There’s actually a bit of planning to do with the new rate cuz during the peak (or after going over the baseline) we started paying much higher rate about 34 cents/Kwh & lowerst 16-17 cents, vs. the old 13 cents flat rate. I confess to finding the PG&E rate structure information quite confusing, and hope that the new EV Schedule the utility company promises for this spring will make it less complex for new electric vehicle owners such as my husband to unravel the intricacies of charging the car during off-peak hours. The PG&E rate options are broken down here. The rate structures are tiered, and break down into two overall options, one for a single meter and one for two meters, the latter being for those who have put their EVSE on a second meter. At a glance, it does not seem economical to go with two meters since there are additional costs involved. However, I am assuming their are some circumstances in which that makes sense? I would love to hear from EV drivers who have chosen a rate plan. Which one are you using and how did you decide on it? How much has your electricity bill increased since you started using an EV? What savings are you realizing compared to driving a gas vehicle? LOL to see myself being quoted. We got the E9-A. Are you able to login your PG&E account and see the smart meter usage? It’s usually delayed by 2 days but still pretty informative. Our utility bill is still relatively low compared to most people I think. This time our electricity portion is $55.02 and the last 4 days of the billing cycle equals to 25% of the entire bill due to the higher-tier rate. Since I became the primary driver of the leaf 2 weeks ago, could be a different story on next utility bill. Everyone’s situation is different but one thing for certain, I don’t have to visit gas station every week anymore and that’s at least $50/refill saving. Our sedan becomes my husband’s commute car and that’s another saving (26mpg) vs. his SUV. (18 mpg) Just today, our auto insurance renewal on the sedan & SUV dropped $50. (semi-year) Love all these savings. « Free Electric Vehicle Home Charging Stations? Think again.